What does a modern suburban New England commercial building look like? As with much of our work this project started with developing a Zoning strategy that would allow the owner to take advantage of the many existing non conformities created by the existing building on this undersized lot.we were able to maintain 200% of allowable floor area by stacking that existing square footage on top of each other thereby reducing the footprint creating area for parking and reducing encroachments on 3 out of 4 sides and satisfying DOT requirement creating safer ingress and egress. All of this was accomplished with architecture. Face ting the plan to accommodate the additional turning and cueing lanes required by DOT while also softened the buildings mass on the narrow lot and eventuates entry. 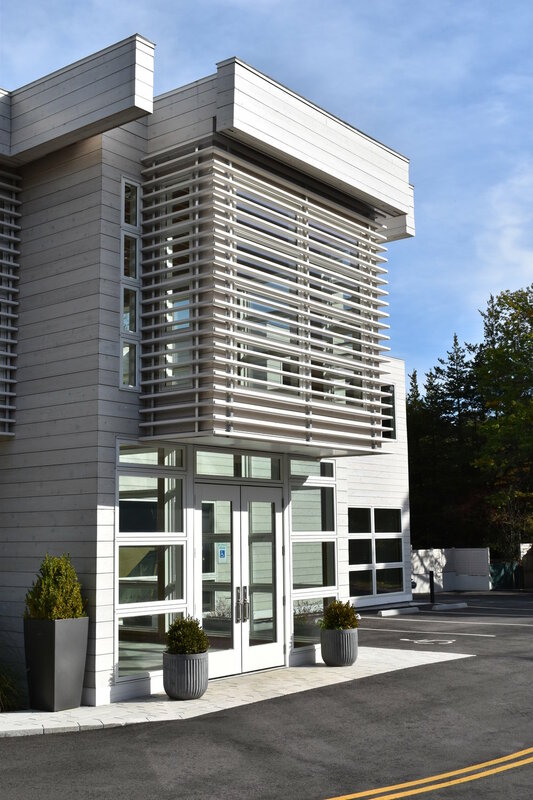 We were interested in creating a modern commercial façade that was contextual to this New England beach town. Creating heavily fenestrated façade fostered the commercial use but using primarily timber construction and cedar louver screens.